I am a Pinterest addict and a foodie through and through! I had seen several recipes for mini fruit pies on Pinterest and decided to take the ideas that I had seen and try my own version of the Mini Fruit Pie. 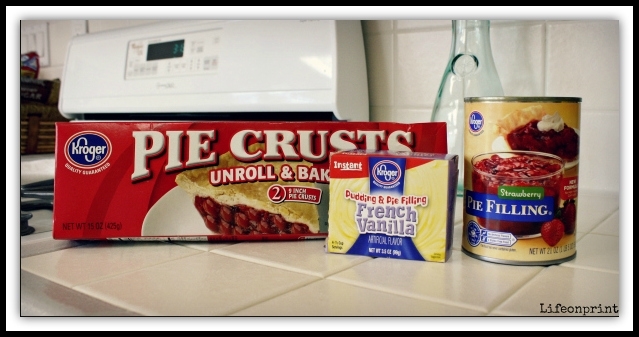 There are quite a few out there, all from scratch, fried, baked, and different shapes…as busy as I am, I decided to go the easy route and use ready and easy to mix store-bought products for my Mini Pie recipe. 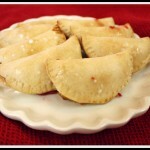 I used pre-made, refrigerated pie crust, can of pie filling (I used strawberry but any flavor would be yummy!) and I also wanted to try a pudding filled pie, so I picked up an instant pudding/pie filling mix. Next I began to fill the circles with filling being careful not to use too much or it will be hard to seal them (but the ones that oozed out were still so yummy!) Place filling in the center, then fold over and press with finger to close, you can use a little water on your finger tip to help with sealing if needed. Then to make them pretty and double seal them I pressed the edges with a fork. Then I placed the pies on a parchment paper lined large cookie sheet (about an inch apart), placed the cookie sheet in the pre-heater oven and baked! 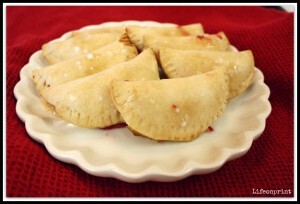 I glazed mine with a powdered sugar and water glaze, served warm or cooled these pies are so ding dang good! Perfect for a quick snack or a party, everyone will love these mini pies! The fruit ones were great but I loved the pudding ones! Mini pies are fun to eat. 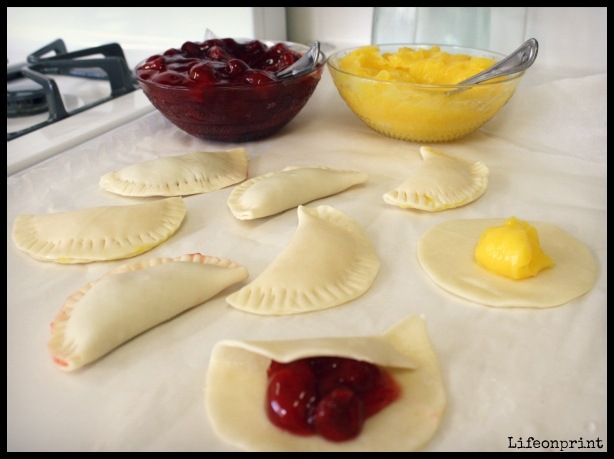 Make some tiny pies with fruit fillings and some with pudding - something for everyone. Try your own variation of these fun and easy mini pies, different sizes, filling flavors, even melted chocolate chips for filling or drizzled on top would be amazing!! Enjoy! Oh goodness! This is going to cost me some pounds and inches but I think it will be well worth it! I will be making these tomorow. Thanks for sharing. I will have to try making these. My grandmother used to make them from scratch, but I have never attempted that. Her house always smelled good! Thanks for sharing this recipe! I never knew I could bake pie. Thank you soo much for this recipie. I made them for a bake sale for a friend with cancer. Hope everyone enjoys these as much as I do. Btw- I am calling them “my pies” as in… this is “My pie”, get your own! Yum!! 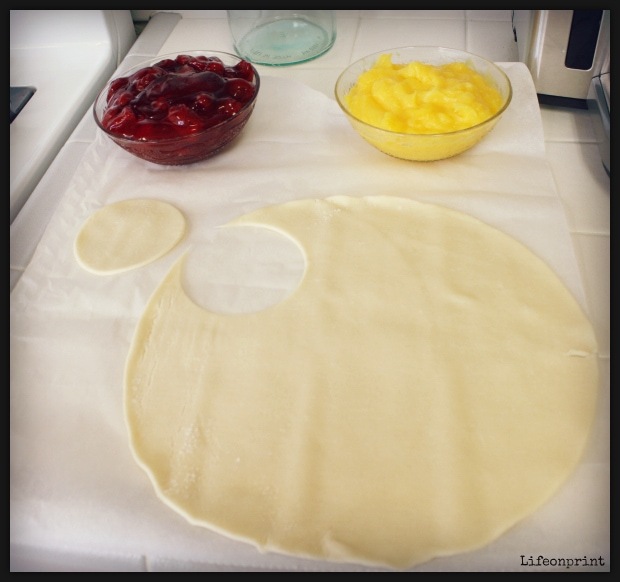 This reminds me of the little pies that you can buy in stores, now I can make my own!! Thank you for sharing this recipe.